Heat Illness can be categorized by order of increasing severity as dehydration, muscle cramps, heat exhaustion, and heat stroke. The warning signs, symptoms, treatments, and return to activity protocols will be covered in this article, but suffice to say that heat stroke can result in permanent disability or death and the related liability implications for the sports or recreation organization and its people. Although heat stroke death can occur in almost any high exertion sport, most occur during the first week of pre-season football practice. 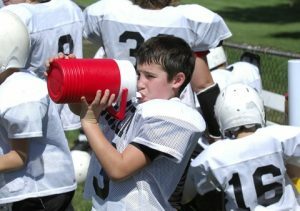 For football specific information, see Guide to Preventing Heat Stroke Death in Youth Tackle Football. From a physiological point of view, any factor that causes core body temperatures to rise to high levels can lead to decreased athletic performance or heat stress. These factors include high physical exertion levels/duration/infrequent hydration breaks, high environmental temperatures, high humidity which decreases evaporation, low sweat levels (dehydration), lack of heat acclimatization, heat retaining clothing and protective equipment, and physical conditions which make certain individuals more susceptible to heat illness. The risk of heat illness increases for sports and activities that have higher physical exertion levels, longer durations, and infrequent opportunities for hydration breaks. As a result, athletic administrators and officials must take additional safeguards to protect athletes engaging in these sports and activities. Examples of sports with high physical exertion levels include football, basketball, soccer, wrestling, boxing, and track and field. Examples of sports with longer durations include pre-season football practice, distance running, cycling, tennis, and baseball. Examples of sports with infrequent hydration breaks include soccer, lacrosse, and distance running. 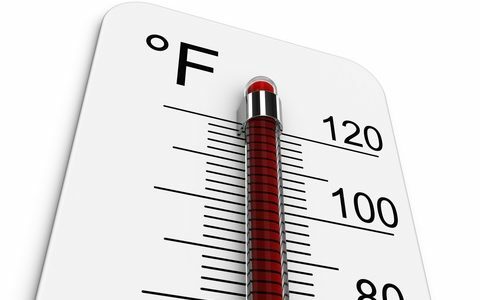 As environmental heat temperature increases, activity must be modified in terms of decisions such as cancellation, postponement, exertion levels, length of practice time, and length of breaks. The old decision making standard in sports and recreation was heat index. 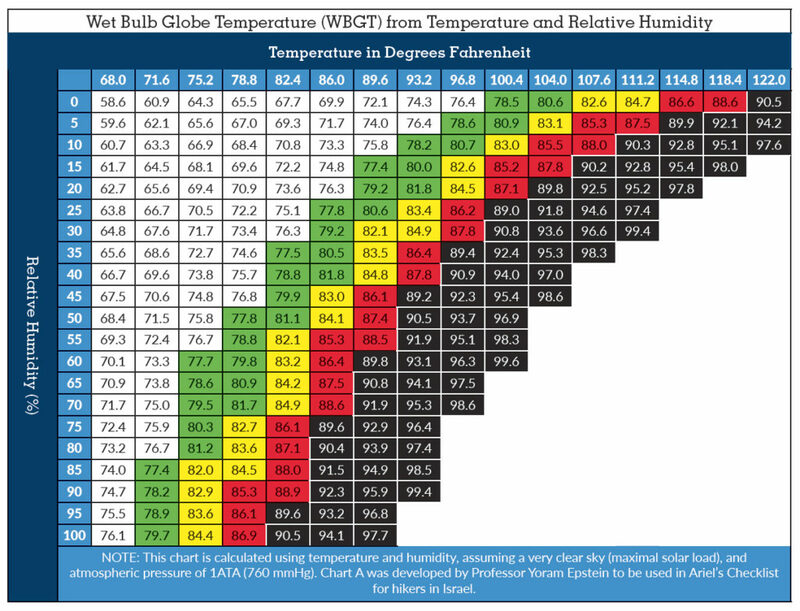 The new, superior standard, is Wet Bulb Globe Temperature (WBGT). WBGT is a measure which has been used by the military for some time and takes into account the impact of air temperature, humidity, sun angle, cloud cover, and wind speed on the human body. WBGT meter prices continue to fall and one can be purchased for as little as $114. However, if this presents a problem, Weather FX offers a smart phone app which provides a mathematical approximation of WBGT at a cost of $0.99. Under 82.0 Normal Activities: Provide at least three separate rest breaks each hour with a minimum duration of three minutes each during the workout. 82.0 to 86.9 Use discretion for intense or prolonged exercise and watch at-risk players carefully. Provide at least three separate rest breaks each hour with a minimum duration of four minutes each. 87.0 to 89.0 Maximum practice time is two hours. For Football: players are restricted to helmet, shoulder pads, and shorts during practice, and all protective equipment must be removed during conditioning activities. If the WBGT rises to this level during practice, players may continue to work our wearing football pants without changing to shorts. For all Sports: Provide at least four separate rest breaks each hour with a minimum duration of four minutes each. 90.0 to 92.0 Maximum practice time is one hour. For Football: no protective equipment may be worn during practice, and there may be no conditioning activities. For All Sports: There must be 20 minutes of rest breaks distributed throughout the hour of practice. Over 92.0 No outdoor workouts. Delay practice until a cooler WBGT level is reached. Source: Georgia High School Association. These guidelines were created in Georgia and assume that athletes from Georgia are acclimated to higher temperatures. For this reason, the activity guidelines should be altered based on other regions. Athletes residing in the Northeast part of the country are accustomed to cooler temperatures than those in the Southeast or Midwest regions. Dehydration of 1% to 2% of body weight can make an athlete feel badly and can decrease athletic performance. Dehydration of 3% can further impact physiologic function and increases the risk of more serious heat illnesses. Preventing dehydration is perhaps the most important factor in preventing heat illness. The early warning signs of dehydration include dark yellow urine, loss of energy, dizziness, cramps, loss of coordination, headaches and unusual fatigue. Athletes reach dehydration levels more quickly if they begin their workout dehydrated. Athletes should pre-hydrate and should not wait until they feel thirsty because by that time it will be too late. Higher heat/humidity, exertion levels, and duration of exercise require higher amounts of pre-hydration. At a minimum, athletes should drink 8 to 16 ozs. of liquid (water or sports drink) one hour prior to exercise. Fluids should be easily accessible during workouts, practices, and games. Athletes should be encouraged to drink to excess of thirst to minimize losses in body weight but should not over drink either. During exercise, athletes should drink, at a minimum, 4 to 8 ozs. every 15-20 minutes. Sports drinks are preferred over water since the carbohydrates in sports drinks provide energy and electrolytes (i.e. sodium and potassium) to encourage voluntary drinking and to minimize muscle cramps. After exercise, athletes s hould rehydrate as soon as possible (completely within two hours) with a volume that exceeds the amount of weight loss. As a general rule, athletes should drink at least 16 ozs after exercise to counteract the consequential urine losses incurred during the rapid rehydration process. Scales should be accessible to measure and monitor post exercise weight with pre exercise weight. Athletes who lose five percent or more of their body weight over a period of several days should be medically evaluated with activity restrictions until rehydration has occurred. Urine volume and color is another measure of general hydration. If output is plentiful and if the color is pale yellow, the athlete is not dehydrated. Acclimatization is the process through which the body deals with being introduced to a hot environment. Exercise intensity and duration should be gradually increased over the first two to three days of training as this is the time period in which most serious cases of heat illness occur. The body’s sweat rate increases after 10 to 14 days of heat exposure. As a result, a greater fluid intake will be required after acclimatization. In addition, increased sodium intake may be necessary during the first 3 to 5 days of heat exposure sine the initial increased sweat rate will result in more sodium loss. After 5 to 10 days, the sodium concentration in sweat will decrease and additional sodium supplementation should not be necessary. Excessive clothing and protective equipment such as helmets, shoulder pads, and tape increase heat stress by both interfering with evaporation of sweat and inhibiting pathways for heat loss. Dark colored clothing increases the body’s absorption of solar radiation. Stretch materials such as “under armor” can add another layer of insulation to the body. Minimize the amount of equipment and clothing worn by athletes on hot and humid days – particularly during an acclimatization period. Frequent rest periods should be scheduled so that equipment and clothing can be loosened to allow heat loss. Avoid wearing dark colors on hot days. Many of these predisposing factors are discoverable by a well designed pre-participation medical screening form while others are discoverable by close observation. Heat cramps are the mildest form of heat illness and are commonly related to low sodium and chloride levels. Warning signs and symptoms include intense muscle pain not associated with pulling or straining a muscle and persistent contractions during or after exercise. Heat cramps should be treated by stopping activity and gently stretching and massaging the affected area. The athlete should immediately consume a sports drink containing sodium. The athlete can return to play when the cramp has gone away when he/she feels and acts like playing again. Heat Exhaustion is a moderate heat illness that occurs when an athlete continues to be physically active after starting to suffer from heat stress. The signs and symptoms include dehydration, chills, dizziness, fainting, loss of coordination, profuse sweating or pale skin, stomach/intestinal cramps, persistent muscle cramps, headache, nausea, vomiting, or diarrhea. Heat exhaustion should be treated by moving the athlete to a shaded or air conditioned area and removing any extra clothing or equipment. The athlete should lie down with legs raised above heart level. The athlete should be cooled by fans and/or cold towels. If not nauseated or vomiting, chilled water or a sports drink should be consumed. If the condition does not improve rapidly, the athlete should be transported for emergency medical treatment. The athlete should not be allowed to play again until all symptoms of heat exhaustion and dehydration are no longer present. Play or practice in the heat should be postponed until at least the next day and possibly longer depending in the severity of the heat exhaustion. If emergency medical treatment was received, the athlete should not be allowed to return without specific return to play instructions from the doctor. Heat stroke is a severe illness that occurs when exposure to heat overwhelms the body’s cooling mechanism leading to soaring body temperatures that can result in permanent disability or death if left untreated. The signs and symptoms include core body temperature (rectal) that exceeds 104° F, altered consciousness, seizures, confusion, emotional instability, irrational behavior, or decreased mental activity. Other signs and symptoms include nausea, vomiting, diarrhea, headaches, dizziness, hot skin (dry or wet), increased heart rate, decreased blood pressure, and fast breathing. It is important to note that there is common misconception that athletes stop sweating during a heat stroke. However, that is not always the case as the athlete is usually sweating at the time of collapse. If the other symptoms point to heat stroke, don’t delay immediate action just because the athlete is sweating. In a recent survey, 70% of parents could not identify the signs and symptoms of heat stroke. Heat stroke should be treated by calling 911 for transport to a local hospital. While waiting for the ambulance to arrive, begin aggressive whole body cooling by removing extra clothing and equipment and by immersing in a tub of cold water if available. In the alternative, use fans, ice, or cold towels placed over as much of the body as possible. According to National Athletic Trainers Association (NATA), heat stroke death is 100% preventable when immediate, whole body cold water immersion is used upon suspicion of exertional heat stroke. Immersion tubs do not need to be expensive, they can be a kiddie pool or large Rubbermaid container. For more information on cold water immersion, see Ice Water Immersion Best for Treating Heat Stroke and Practical Guidelines for Implementing Cold Water Immersion for an Exertional Heat Stroke Patient. The athlete should not be allowed to return until his/her doctor approves and provides specific return to play instructions. The athlete should return to physical activity slowly and under the watchful eye of a trainer or other health care professional. Educate administrators, officials, and coaches on all aspects of heat illness. Purchase a Wet Bulb Globe Temperature meter or use Weather FX app. Practices and games may need to be postponed and rescheduled to avoid peak temperatures. Practices may be modified to shorten their duration, intensity, and equipment usage. Mandatory non-routine fluid breaks should be scheduled during practice and games. The normal work/rest ratios may need to be modified during games or practice. Water and/or sports drinks should be readily available. Game rules can be modified to allow unlimited substitution. Pre-participation screening including questions about fluid intake, weight changes, medications, history of prior heat illness, etc. to identify athletes that are at higher risk. Emergency action plan for EMS access and to make available immersion tub to treat heat stroke. Always follow the rules of the respective governing body (if any) to comply with procedures that have been established to protect against heat illness. Consider providing outsourced medical services on site such as a certified athletic trainer or an emergency medical technician. Position Statement and Recommendations for Maintaining Hydration to Optimize Performance and Minimize the Risk for Exertional Heat Illness. NFHS, Sports Medicine Advisory Committee, 2014. Heat Acclimatization and Heat Illness Prevention Position Statement; NFHS; Sports Medicine Advisory Committee; April 2012. Michael F. Bergeron. Heat Acclimatization and Heat Illness Prevention – for Safety and Performance; National Youth Sports Health & Safety Institute.